This page is dedicated to serious people — advertisers. If you want to advertise your business on the beltoprent.com, feel free to contact us any time you want. Why do you need to advertise your business on our website? Well, this site was opened years ago to help foreigners with accommodations in Belarus. We have constant, quality, niche traffic. If you want to promote your business to forigners, who will come to Minsk or other city in Belarus, than BelTopRent is the best option. Thousands of people from all around the world visit our website every month to find apartment rentals or hotels in Minsk, or just to read our latest travel and real estate news. Wilde range of travel services making us as unique as possible. We don’t copy other websites. We have our own strategy and points how to help to beautiful country Belarus to increase ammount of people who would like to come and see what a real life looks like in the very center of Europe. What type of advertisers are welcome? Owners of Minsk night clubs, casinos, restaurants, pubs, etc are always welcome to place an ad about their business. If you want to promote stuff like eco tourism, etc, feel free to contact us. 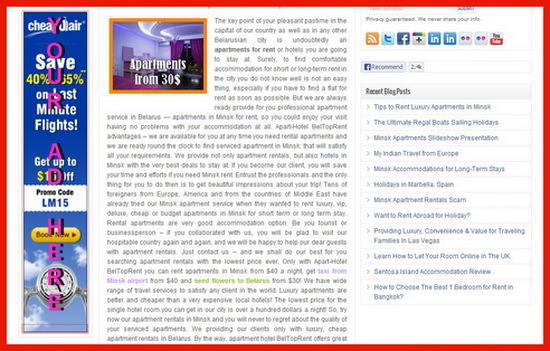 There are many websites that promote Minsk apartment rentals. If you are the owner of any, feel free to contact us. Your rental business can be featured on the BelTopRent too. Are you Minsk apartment rental owner? Feel free to contact us. Your apartment can be advertised even for free. What ad options are available? Currently you can choose from three banner ad options on our website. Place your add on the right side of BelTopRent’s header. Recommended size of banner for this add is 468*60. Please, make sure your banner have size we mentioned. Top add place! Recommended size of baner is 728*90. Make sure your banner have this size. Otherwise your ad will be rejected. You can ad a banner ad to the left sidebar of the beltoprent.com. Recommended banner size is 120*600. You can submit your article in English, Russian or Turkish to our website. More information here. The lowest ad price start from 99$ a month. We have 20% discount if you would like to place your banner ad for at least six month. You can pay for this service with all major cards. If you want to pay using PayPal, price will be higher for 25%. If you are interesting in any of our banner ad options, feel free to contact us using the form below. We speak Belorussian, English and Russian. To your success! Sincerely, The BelTopRent Team!